EE HUNT. Terror on E. 72nd St.
A violent encounter between two men on East 72nd Street in Manhattan precipitates a series of conflicts between U.S. federal agents and Canadian Islamic terrorists who seek to destroy the Statue of Liberty in New York Harbor. From the Catskill Mountains and the Bear and Fox Club to a hazardous BC ferry crossing from Vancouver to Victoria to an abandoned steam rail tunnel leading to the Brooklyn waterfront and a stolen fireboat the protagonists play a game of cat and mouse resulting in murder, mayhem and martyrdom. Every step of the way is laden with a succession of chilling turns of events and unexpected encounters with evil that will keep your attention glued to the very end. Read Amazon.com reviews of Terror on East 72nd Street HERE. 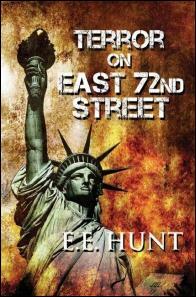 "Terror on East 72nd Street is one of the best books I have read. The suspense will keep you from putting it down. I had to read from start to finish. I couldn't stop until I finished the last page. This writer knows how to keep his readers in his grip." Links to additional resources relevant to "Terror on East 72nd Street".